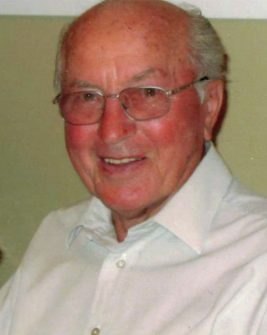 Andrew (Andy) Zei was born in Szakadat, Hungary in 1925 and moved to Canada with his family at the age of three. Andy was involved in the tobacco industry in Norfolk County for more than six decades, taking over from his father who started growing tobacco in 1938. He planted his first crop in 1951 and by 1955, he was one of two tobacco growers who received the top price of 51 cents per pound. Andy’s tobacco crop was one of the finest in the County. Andy served on the Ontario Flue-Cured Tobacco Growers’ Marketing Board for forty years. In his role as a Committeeman, he represented more than 200 growers and acted as a liaison between the growers and the Board. He was responsible for relaying information on policy and marketing issues to growers and relaying the growers’ concerns back to the Board. In his first year as a director, Blue Mold devastated the Ontario tobacco crop which caused a dramatic drop in yield and quality. Crop insurance coverage became an important issue. Other continuous issues the Board had to deal with included how to handle the payment for surplus tobacco in storage and the quota change from acreage to poundage. As a director, Andy was responsible for negotiating crop price. Negotiating with the tobacco companies to set next year’s price was demanding work. It meant that Andy spent a good deal of time away from home. Andy also participated in trade missions which were extremely important to the Ontario tobacco industry. During Andy’s first mission to Egypt, a lucrative contract was negotiated – 10 million pounds of tobacco would be shipped to Egypt. During his tenure as a board member, Andy was appointed as the Tobacco Board’s representative to the Ontario Federation of Agriculture. he was also a member of the Norfolk Federation of Agriculture where he was a strong proponent for tobacco growers. Andy was very involved in the local riding association, sitting on the executive at both the provincial and federal level. He was an advocate between the local farmers and politicians. He advised M.P.s and M.P.P.s on local agriculture issues. Andy had been a tireless volunteer in his community. He is a member of the Knights of Columbus and served as a Grand Knight. His involvement in the St. Ladislaus Roman Catholic Church in Courtland including serving as a Eucharistic Minister. When Our Lady of Fatima School opened in 1958, Andy was elected as a school board trustee. He also served as the President of the school’s Parent Teacher Association, reportedly the only man to ever hold this position. He served as the Ontario Flue-Cured Tobacco Growers’ Marketing Board’s representative on the Delhi Tobacco Museum and Heritage Centre’s Advisory Committee for the past 10 years.